Our old building is heated by steam, a system that was installed back in the 1940's. The boiler, which was most recently replaced in the 1980's, sits in the basement of the apartments we own to our West. The steam pipes, buried in the earth, between the boiler room and our clubhouse, were almost as opaque as a screen door. Steam emanating from the earth out back was regularly visible in winter months, it took hours to get heat into our clubhouse. We dug up, chopped up, and disposed of the old sub-terrarium pipes. The drop at the retaining wall was particularly difficult, requiring digging a trench about 9' deep. 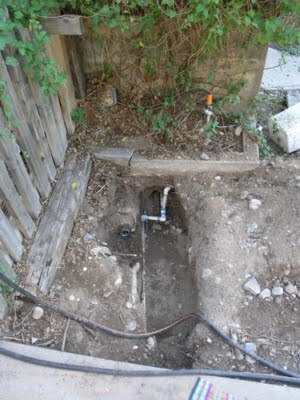 We installed new pipe, shown in these pictures. Here, the pipe rises from the lower grade. The water pipe (right with white rag tied on it) was leaking like a sieve also. 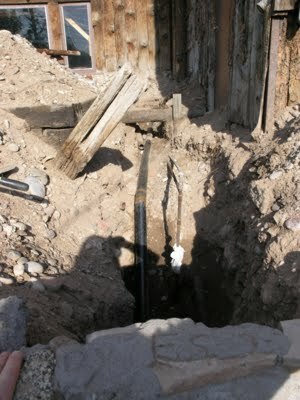 This is the pipe that supplies water to the apartments. We replaced it while we had the trench open. 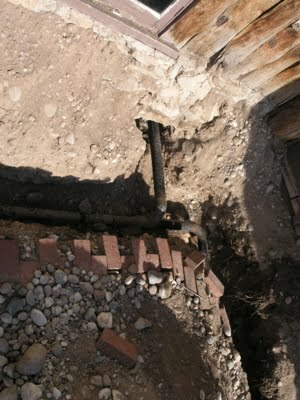 The pipe projects out below the retaining wall, ready to be extended across under the sidewalk and into the sleeve below the apartment porch. 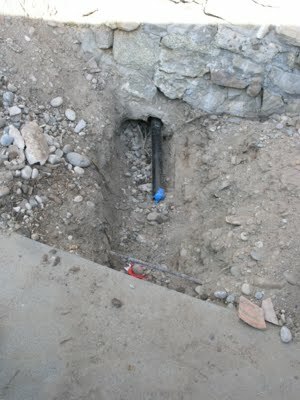 The white (pvc) water pipe was replaced, the steam pipe was then installed in the open sleeve to the immediate left of the pipe. this sleeve transverses the porch, entering the wall of the boiler room in the basement of the apartments. The pipe enters the pool room, continuing around to the north wall of the pool room. 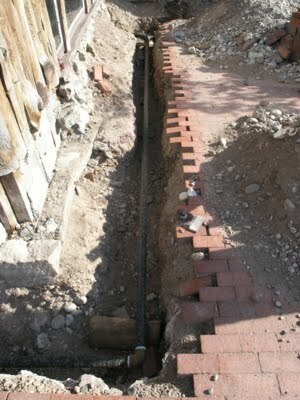 After the pipe was fully installed, we wrapped the pipe with cardboard to allow for expansion, then wrapped the cardboard with plastic wrap to protect the cardboard from moisture, then placed an insulating concrete around the piping, followed by back-filling the trenches and restoring the brick patio. The insulating concrete is a mixture of portland cement, styrofoam beads, and a little bit of water. It works. The repaired system works much better. The building heats much faster with a lot less heat loss in the piping. We estimate the natural gas savings to be about $100 per month during the heating season.